The newspaper business can be extremely cutthroat. In fact, I have known friends who have decided to go and work at another publication only to be escorted from the building when word got out. Disney forums can, at times, be just as malicious. Someone doesn’t like your opinion? Be prepared for a long battle that may include some cutting remarks. These were all things I kept in mind when I started the Main Street Gazette last August. I knew not everyone was going to agree with my opinions, and I expected that my ideas would occasionally be met with venom. 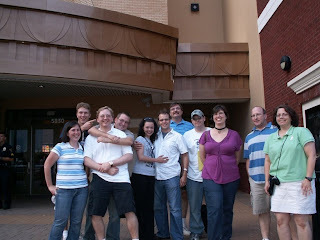 I also expected that the world of Disney bloggers was, perhaps, a Pluto-eat-Goofy type of world. The blogging community is probably one of the most uplifting groups that I have ever had the pleasure of being associated with. I have received, and sent, a fair share of emails correcting a typo or a misstep, after all, we do not all share the same knowledge base. Support can be found almost daily in a comment from another member of the community. There is no one who perceives themselves as better than all of those around them. That isn’t to say that everyone agrees, blows pixie dust at one another, and gets along all of the time, we don’t. Heck, I don’t even agree with my wife all of the time, why would I expect that of anyone else? We have our disagreements over just about any topic in the Disney vernacular, but these arguments are kept to the issues themselves and rarely crumble into personal attacks. And when personal attacks do arise, generally it isn’t another blogger but a comment from the outside, and usually you can count on another blogger to offer support and help guide the discussion back to a more fair debate mode. Disney bloggers, as a whole, don’t thumb their nose at the new gals and guys either. As I said before, we each have our own specific knowledge base and each blogger that joins in the discussion offers a piece of the puzzle, or a slightly askew insight, that maybe hasn’t been available to us before. I’d go so far as to say that I think the amount of discussions our articles do encourage is always below what we would desire. We don’t speak just to hear ourselves speak; we are daily trying to drawn out the lines of communication and spark new ideas. It should go without saying that we are also a fairly humorous group. None of us take ourselves too seriously, and from my experiences are quick to laugh at ourselves and with one another. This goes back to that encouraging and lifting one another up. All in all I am proud to call myself a Disney blogger, it is a pretty unique and spectacular group of individuals. I haven’t had the chance to meet all of the bloggers out there, and I don’t know that I ever will, but it doesn’t mean I don’t feel a kinship to them. We are here to inform and entertain, we’d love to hear from all of you out there, to debate with all of you out there, and to hear what you have to say, whether it is through a comment, an email, or a ‘hello’ when you see us in the parks. Thanks to all of you who read all of us, and thanks to all of the other bloggers out there for keeping on keeping on, you are indeed a magical group of individuals. We aze family; brothers-in-blog. See you a few days! Dole Whip and a rocking chair. Obviously the last comment should have read, "We are family;"
Lovely post, I couldn't agree more!